Less than 200 years ago, there were no House Sparrows in North America. Now these cosmopolitan birds are one of the most abundant songbirds on the continent, with an estimated 150 million birds established in all 48 states. The House Sparrow (Passer domesticus, or HOSP, sometimes called the English Sparrow, domestic sparrow, gamin, tramp or hoodlum) was originally recorded in Eurasia, North Africa and the Middle East. Accounts differ, but it appears that repeated introductions occurred in various parts of the U.S and Canada. Initially, eight pairs were released in Brooklyn, NY in either 1850 or 1851 by a single person/group of New Yorkers. Apparently they died before they could breed. Accounts differ, but it appears that in 1850 Nicholas Pike, Director of the Brooklyn Institute, purchased the first 8 pairs of sparrows from Liverpool, England (the cost of the trip was $200 per Barrows). He released the 8 pairs in the spring of 1851. They did not "thrive." In 1854 and 1858, the bird was introduced to Portland Maine. in 1857, Citizens of New Haven imported some of their own. During the next decade, HOSP were introduced to eight other cities, including release of 1,000 birds in Philadelphia by city officials in 1869, and release by J. M. Brown of two pairs at Galveston, Texas. By 1870, they were established as far south as Columbia SC and Galveston TX, as far west as Davenport Iowa, and as far north as Montreal Canada. Released in San Francisco 1871-1872, and Salt Lake City 1873-1874. Nine birds from New Zealand were introduced in Hawaii in 1871, and HOSP are now found on the main islands. Between 1872-1874, the Cincinnati Acclimatization Society released 4,000 European songbirds of at least 18 different species, including House Sparrows and starlings, in order to "aid people against the encroachment of insects" and ensure that the "ennobling influence of the song of birds will be felt by the inhabitants." Only the starling and the House Sparrow took hold. According to McLoughlin, "Sparrows had become an American fad. Breeders sprang up to supply the new market for the birds,... releasing birds into areas precleared of predators and provided with nesting boxes. In the cities of the new nation the sparrows found an earthly heaven. The ever present horse droppings, livestock and poultry feed, and general garbage, coupled with the vast fields of grain surrounding the cities, made these formerly sparrowless places perfect breeding grounds for the invaders." "Countless private citizens contributed to the spread of House Sparrows by trapping acclimated birds and releasing them" in Texas, Ohio, Utah, Missouri and Georgia. By 1875, the House Sparrow was breeding in San Francisco. Over a period of 11 years, the range of the House Sparrow expanded from a few thousand kilometers in 1875 by more than 1,340,000 square kilometers. They were introduced from Europe to San Francisco and Salt Lake City in 1873-1874. Other introductions occurred, and birds were collected and transported to other parts of the country. Some may have traveled west in boxcars filled with grain. House Sparrows have also been introduced (either on purpose or accidentally) in Jamaica (between 1903 and 1966), the Virgin Islands (since 1954), Cuba (1850? late 1890s? ), Brazil and Venezuela (1872), the Falkland Islands (as stowaways in sheep pens), Australia (1863-1872), New Zealand (1860s), the Bahamas (1875), Bermudas, Nova Scotia, Quebec, Ontario, Greenland, and southern Africa (stowed away on ships), and the main islands of Hawaii (9 birds introduced in 1871 from New Zealand), and Puerto Rico (1978). They are also found in China. An 1883 article in The Messenger (Indiana, PA, 06/27/83) said "The little sparrow has been declared an outlaw by legislative enactment and they can be killed at any time. They were imported into this country from Europe some years ago as a destroyer of insects, but it has been found they are not insectivorous. Besides they drive away all our native song birds and give no equivalent. Let them all be killed." By 1887, some states had already initiated efforts to eradicate HOSPs. States such as Illinois (1891-1895) and Michigan (1887-1895) established bounty programs. According to Keith Kridler, since the bounty on "English" Sparrows was only a few cents per bird in many states, young children killed these birds to earn money for "hard candy." The children quickly learned to wait for the eggs to hatch and thus quadruple their bounty. County clerks often felt sorry for these children, and paid out the bounty on any species of sparrow. A 3/16/1892 article in an Indiana PA paper stated "The different county treasurers of Illinois have paid out in round figures $8,000 as bounty money under a law allowing 2 cents for the head of each sparrow killed during December, January and February in that State. This shows that about 450,000 sparrows were killed, but the frisky bird seems more numerous than ever." On 09/06/1888, The Cartersville Courant-American newspaper noted "The English Sparrow, with its grown and growing progeny, is a conspicuous nuisance. Can there be no way devised to abate him, if not totally, at least partially?" In 1889, in "The English Sparrow in North America Especially Its Relations to Agriculture," Walter B. Barrows recommended the formation of "Sparrow Clubs" with the objective of destroying HOSP via concerted action, offering prizes, etc. In 1910, "How to Destroy House Sparrows" was published as Farmer's Bulletin 383, by author Ned Dearborn. It noted that "the bad qualities of the bird far outweigh its good ones, and, although its extermination is impracticable, a reduction of its numbers is feasible and important. The present bulletin aims to describe the best methods of destruction," and offered plans for traps, along with tips on shooting and poisoning house sparrows. 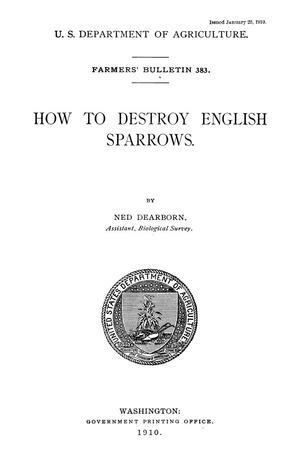 The Agriculture Library (1912) contains a chapter entitled How to Destroy English Sparrows. Date? A Pennsylvania law was promulgated making it desirable to "kill or in any way destroy" English sparrows. In 1917, Birds of America noted "The filthy habits of these birds are most annoying. They gather in immense flocks to roost..." and defile houses and cisterns with excrement and nesting materials. "As a flock of fifty Sparrows requires daily the equivalent of a quart of wheat, the annual loss caused by these birds throughout the country is very great." In 1928, Joseph H. Dodson, bird lover and bird house and sparrow trap manufacturer (patented in 1906? ), wrote "The English Sparrow must go. The bird has wrought a great deal of evil to our country chiefly by its activity in driving away native songbirds....We imported the English Sparrow-that was not Nature's fault. We should rectify our error, drive out the English Sparrow, work together and bring back our native song birds." In 1931, an updated booklet on English Sparrow Control was published by the USDA (leaflet No.61.) It noted that "complete success in control operations can not be expected unless at the same time an effort is made to remove the conditions that attract the birds." By 1943, the population growth from the original 50 pairs in 1853 to a continental population was estimated at 150,000,000 birds (Wing 1943). They were introduced to Puerto Rico as recently as 1978? Reasons given for introduction were to establish wildlife familiar to European immigrants, or to control insect infestations. However, in agricultural areas, an average of 60% of the House Sparrows' diet consists of livestock feed (corn, wheat, oats, etc. ), 18% cereals (grains from fields and in storage), 17% weed seeds, and only 4% from insects. Urban birds tend to eat more commercial birdseed, weed seed (e.g., crabgrass), and human scraps. The diet of nestlings may be up to 70% animal food to encourage rapid growth (McLoughlin). They also drive away other insect eating birds. Since bluebirds did not exist in Europe, they would not have recognized the interference that would result. HOSP have also displaced cliff and Tree Swallows and purple martins. After being introduced, HOSP thrived in areas occupied by humans, eating grain that was left on the ground, undigested grain in horse manure, and trash. HOSP populations may have peaked in the early 1900s. When automobiles and farm machinery replaced horses and farm animals, the HOSPs primary source of food was reduced. There is research evidence that HOSP populations are declining in both rural and urban habitats in Europe (e.g., 60% decline since 1970s in England) but no one has yet determined why. Breeding Bird Survey data also indicate that the population is declining in the Maritime provinces and in the eastern and central United States. Possible reasons that have been proposed are changing agricultural practices such as a shift to monoculture crop plantings and sealing grain stores to reduce access and spillage; increased pollution; use of herbicides/pesticides (and its impact on food sources - HOSP nestlings are exclusively fed invertebrates for the first four days of their life); destruction and/or damage of natural habitats; loss of nest sites; feral cat and hawk predation; and nestling starvation (due to lack of availability of insects, especially for later nestings), adult starvation during winter months (HOSP don't build up fat reserves during winter, perhaps allowing them to escape predation, but making them more vulnerable to a reduced food supply), or infection. A 2006 BBC report indicated that hundreds of birds sparrows, chaffinches and goldfinches are dying England and Wales from trichomoniasis, a parasite that poses no risks to humans but causes lethargy and death within 3 weeks. However, the 2004 Audubon "State of the Birds" reported that nearly 30% of all bird species in the continental U.S. and Canada are in serious decline, primarily due to loss of habitat. So if House Sparrow populations are actually in decline in the U.S., as they are in England, they are not alone. Unfortunately HOSP are not the only songbird in decline. Changed practices have probably impacted populations, but any HOSP decline may be more noticeable than that of other birds because their numbers were so large. With the proliferation of fast food restaurants and stores such as Home Depot (with an almost endless supply of bird seed, water and nesting areas); homeowners who feed inexpensive bird seed mixes containing millet and cracked corn; and people or businesses who leave food waste out, House Sparrows should continue to be ubiquitous in the U.S.
Invasive/nuisance species like House Sparrows generally share the following characteristics that enable their populations to explode. Reproduce rapidly: HOSP are prolific breeders. They may raise 2-5 (average of 3) clutches of 3-7 (very seldom less than 4) chicks each breeding season, (averaging 20 chicks per season). One pair can theoretically quintuple the population in one year. Using some conservative assumptions, one pair could increase to 1,250 birds in 5 years. Both sexes work to quickly build a nest. Eggs are incubated for 10-16 days, and nestlings are fully feathered in 15-17 days. JC McLoughlin did note that more than half of all adult House Sparrow deaths occur during the three month breeding period due to increased exposure and energy drain. Effective dispersal mechanisms: HOSP have no recognized migration pattern, but flocks of juveniles and non-breeding adults may move 1-5 miles to new feeding areas, or they may fly a mile or more in late summer and early autumn to roost with a flock. Human intervention in terms of multiple introductions was a major factor in dispersal. Not being exposed to the perils associated with migration might actually increase their survival rate. Grow rapidly: HOSP eggs hatch in 11 days, and birds fledge when only 14 days old, and young are independent 7-10 days after leaving the nest. (Compare to 12-18 days incubation and 12-19 days fledging, and independence at 30 days for Eastern Bluebirds.) They quickly reach sexual maturity (as early as 9 mos. per McLoughlin. A 1986 study by Thuberin Guatemala indicated they may start breeding at 4 to 6 months). They also have a relatively long life span (the record for a wild HOSP is 13 years 4 mos. ), although their typical lifespan in the wild is probably about three years. Aggressive competitors: HOSP begin nesting in late winter and early spring, beating other migratory birds such as Eastern Bluebirds, purple martins, and Tree Swallows to preferred nesting sites. They are aggressively territorial in their attachment to a nest site. They have a powerful crushing finch beak used to destroy eggs, nestlings and parents of other birds, and to attack occupants of nearby nestboxes. They may also attack other birds while they are feeding, and will overwhelm a bird feeder. They are persistent - Frank Navratil reported watching sparrows try to enter a tiny wren house with a 1-inch diameter entry hole for days at a time. HOSP are also fairly intelligent. A fast food restaurant in Australia had a set of doors that opened automatically when an "electric eye" was tripped. HOSP learned to hover in front of the electric eye until the door opened, or to sit on top of the eye and lean over until they tripped the sensor (Barn swallows have also reportedly learned to fly in front of sensors to open doors). The combination of these factors has resulted in a very successful infestation of these "weeds of the air." Origin: Some sources say HOSP are native to Britain, northern Scandinavia, and northern Siberia to northern Africa, Arabia, India, and Burma. Classification: Many sources (especially pre-1970) indicate that HOSP are Weaver Finches (instead of Sparrows) and put them in the family Ploceidae. 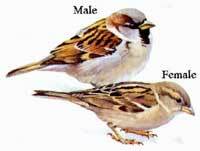 According to Sibley-Ahlquist taxonomy, which is based on DNA studies, the HOSP is an "Old World sparrows" ("true sparrows"), and member of the family Passeridae. Weaver finches are sometimes considered a subgroup of this family. Others consider them as members of a separate family, Estrildidae. "New World sparrows," like the Song Sparrow, White-throated Sparrow, and Chipping Sparrow, are members of the family Emberizidae (called Emberizine Sparrows). House Finches and Goldfinches are included in the family Fringillidae ("true finches"). Some people still classify many of the New World sparrows in this family. Passer domesticus, the scientific name, means a small active bird of the house. Linnaeus originally named it Fringilla domestica, but HOSP were placed in the Passer genus in 1760. "WORDS ON THE WING" by Kim Todd. From "Tinkering with Eden: A Natural History of Exotics In America". W. W. Norton & Company, New York, 2001. D. Summers-Smith. 1980. Br. Birds 73:325-327 (coal mine). W. B. Barrows 1889. The English Sparrow in North America, especially in its relations to agriculture. USDA, Div. Econ. Ornith. Mammal. Bull. 1: 1–405. Lowther, P.E. (2006). House Sparrow. (Passer domesticus). The Birds of North America Online (A. Poole, Ed.). Ithaca: Cornell Laboratory of Ornithology; Retrieved from The Birds of North American Online database: http://bna.birds.cornell.edu/BNA/account/House_Sparrow/. J. L. Long 1981. Introduced birds of the world. Universe Books, New York. W. A. Thurber 1986. Range expansion of the House Sparrow through Guatemala and El Salvador. Amer. Birds 40: 341–350. L. Wing 1943. Spread of the Starling and English Sparrow. Auk 60: 74–87.